Stretching from inland rivers and bays to the edge of the continental shelf, the coastal ocean accounts for about 10 percent of the ocean’s surface area. Yet this relatively small sliver of ocean contains about half of all the microscopic plants adrift in our seas. With satellites we can see what fishermen find with their nets: Coastal waters are the most biologically productive portions of the world’s oceans. Acre for acre, the coastal ocean is as productive as a prosperous Midwestern farm. This is not necessarily a surprise. Microscopic plants, or phytoplankton, form the base of most of the food webs in the ocean. Microscopic animals (zooplankton) eat the phytoplankton, and are in turn eaten by other, larger animals. Increased biological activity by plants enhances animal activity. 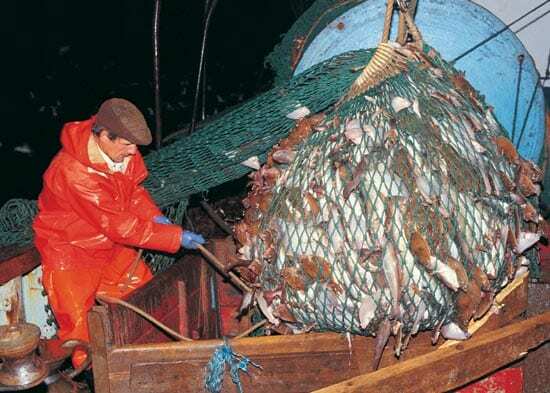 Most of the world’s great fisheries lie within coastal waters. But why is this area so much more productive than the rest of the ocean? Growing microscopic plants is like growing a lawn: Both nutrients and light have to be available in the right quantities to allow photosynthesis to take place. Since light typically penetrates just the top 50 to 100 meters (150 to 300 feet) of the ocean, the problem comes down to having a sustained supply of nutrients in the upper layers of the water. In the deep, open ocean, when nutrients become available near the surface, plants bloom, die, decay, and sink, often to a depth where there is no light. Instead of being recycled, the nutrients consumed by these plants accumulate in the depths, out of the reach of new plants. So while the open ocean can experience transient blooms, there is usually not a sustained supply of nutrients in the upper ocean to promote plant activity. The coastal ocean teems with life because there are mechanisms for tapping this store of deep nutrients and for drawing plant food from other marine environments. There is no one mechanism at work on every coast, but different processes at work in different places. Some are well understood, while others remain a mystery. One well-understood example is wind-driven coastal upwelling, a process that taps into the store of nutrients stockpiled in the deep. Along some coastlines, strong winds blow parallel to the coast during certain seasons. These persistent breezes push water downwind, while the force of Earth’s rotation (called the Coriolis force) deflects water to the right of the winds (left in the southern hemisphere). As a result, the waters in the turbulent upper 10 to 30 meters of the ocean are blown offshore, drawing colder, nutrient-laden waters from the depths to replace them. The surface waters in regions of coastal upwelling are cold and nutrient-rich, promoting robust growth of plants and the animals that feed on them. But this mechanism can only be effective in places where the winds blow in the right direction. These special places—coastal California, the Iberian-Canary system off Spain and Portugal, coastal Peru and Chile, and the Benguela system off southwestern Africa—are home to some of the world’s most important fisheries. As much as 40 to 50 percent of the world’s commercial fish catch comes from upwelling areas that comprise just 1 percent of the global ocean. Another well-known mechanism for coastal productivity is river outflow. Natural and manmade nutrients—principally nitrates and phosphates—run off the land and fertilize marine plants. 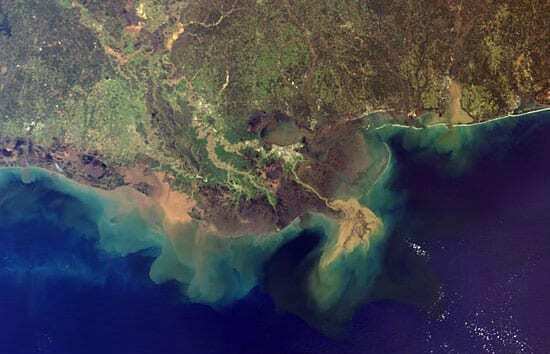 River outflow is best known for building productive regions in the North Sea and in the Gulf of Mexico. This fertilizer can be a mixed blessing. When too many nutrients are released into seas, bays, and estuaries, it can create an overabundance of decaying plants and animals, depleting oxygen from the water. 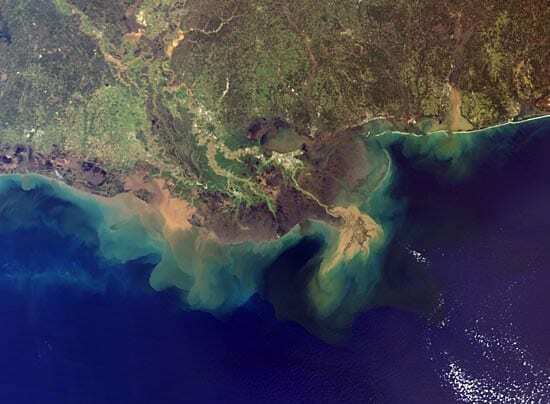 These nutrient-rich, oxygen-poor waters become dead zones, driving animals to migrate or die. This may be the greatest threat to the health of our marine environment. While the fuel for some productive coastal zones is well understood, it is surprising how little we understand about other historically important regions. Georges Bank off the New England coast is one of the world’s most productive fisheries and known to sustain high production of microscopic marine plants. Wind-driven upwelling cannot be a factor here and the region is too far from land for runoff to be important. The Georges Bank system is dominated by extremely strong tides and sharp fronts, where water masses with stark differences in temperature or salt content intersect. There are several similar systems around the world—including the Yellow Sea and the Grand Banks—but no one has directly observed a means for providing nutrients in these areas. In the past few years, researchers have proposed some sound hypotheses and theoretical models involving the interplay of tidal pumping and ocean mixing. But none of those theories has been tested in nature. While there is no solution to the Georges Bank enigma, at least there are some promising hypotheses. In the Gulf of Alaska, we don’t have a clue. None of the well-understood mechanisms work in this incredibly productive region. The winds blow in the wrong direction and the coastal runoff is pure, low-nutrient water. There is no strong hypothesis to account for the productivity of the area, though that does not stop the fishing boats from proving the waters are rich. How could we still have such gaps in our fundamental knowledge as we begin the 21st century? Perhaps the biggest reason is the cost and difficulty of making observations in the ocean. We just don’t have good factual descriptions and observations of some regions, although coverage is rapidly improving around the United States. It is only through direct observations that we can detect nutrient pathways or at least gather enough clues to allow the formulation of strong hypotheses based on computer models. Our biggest challenge is to develop and improve our ability to make these observations—of nutrients, currents, and the abundance of phytoplankton—in the right places, at the right times, and at rates and scales that can be compared. This means collecting data over months and years, rather than through isolated, intermittent expeditions. We are at a wonderful juncture where critical new ocean technologies are in sight, and we have the right sort of questions and problems to solve with them. Some tools are emerging—particularly autonomous underwater vehicles, remote sensors, and coastal observatories—that promise to make our observations more specific and more quantitative. At the same time, our numerical models are becoming increasingly realistic and useful. This interplay of models and observations is proving extremely productive, as in the case of Georges Bank, where we now have a specific hypothesis to test. The reasons for understanding productivity in the coastal ocean extend well beyond the curiosities of pure science and the livelihood of our fishermen. The biological activity along our coasts has important implications for human activity on the land. For instance, toxic blooms caused by polluted and excessively fertilized waters can hamper recreation and sicken humans and marine life. Also, as marine creatures generate wastes, decompose, and sink, they provide a means for removing carbon from the upper layers of the ocean and, in turn, removing greenhouse gases from the atmosphere. The coastal environment is the most familiar and most connected with human life. It is also most affected by human activity. Understanding the reasons for the marvelous abundance of life in these regions will give us a means to ensure our own life along the water’s edge.